Photo of Obama just before his speech in Berlin recently. Thanks Lolade for the headzup. Click to enlarge as per usual. Lol...na wa o. What does Nigeria have to do with Obama? Yet, I smiled a little when I spotted the flag...patriotic citizens. May Nigeria improve in its economy, wealth, infrastructure, and wisdom! N100m well spent by madman! You can see how tolerant Germans are to allow such a thing to occur in their midst. The event had nothing to do with Nigeria, but there you go. The authorities didn't see fit to intervene (and remove the flag) and the crowd didn't beat up the flag bearers and burn the flag or shred it. One can only hope that people elsewhere in the world can display such tolerance (Nigerians included)!! To the anti-anonymaus, this speech is primarily about America and Europe coming closer together to tackle the problems facing the world. The speech was not delivered at the UN in New York or Switzerland or elsewhere, but in the heart of Europe in Berlin, Germany, the economic heart of the EU (European Union). 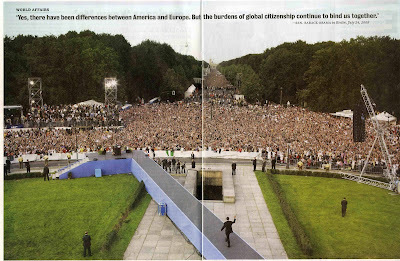 The speech wasn't about the United States and it's cooperation with Africa, but with Europe primarily. As such the Nigerian flag had no business being on display. The point I was making which you overlooked, is that in some parts of the world, displaying a flag that is not to the liking of some members of the crowd could result in needless violence. I was stating that the tolerance displayed by the crowd in Germany is commendable. I'll give you the link for Obama's speech, go read it for yourself, before emerging with your unwanted insult. (join up the link and paste it into your browser). I have no problem with disagreements or counter points of view, but to throw an insult because you don't like the tenor of what is being said. I refuse to stoop to that level. look! he's walking out over a giant nigerian flag! it must be a message, some kind of codified approval of yar'adua and the seven point agenda!